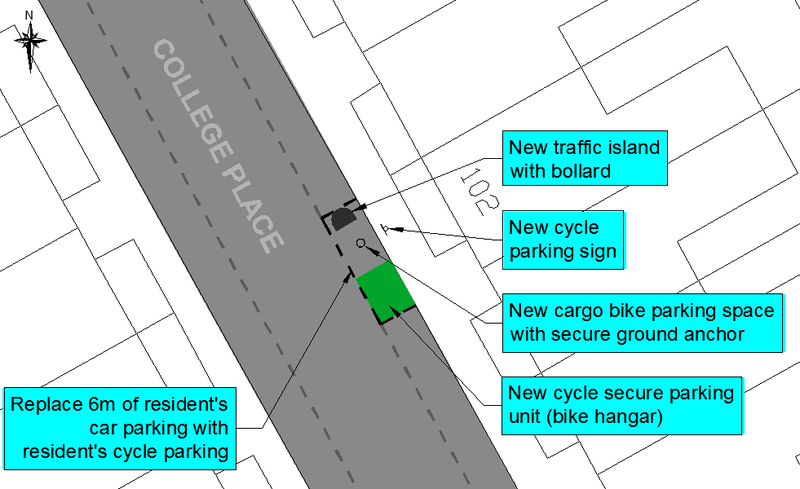 We are seeking your views on the Council’s proposal to provide a secure cycle parking unit (‘bike hangar’) in College Place. In addition, following a request from a resident on this street who does not have outside space to store a cargo bike, we are proposing to introduce a cargo bike parking space next to the bike hangar. The use of cargo bicycles for everyday travel is in line with Camden’s Transport Strategy to promote active and sustainable transport, and the lack of available space for these bicycles is a barrier to ownership and use. In Camden there is also a growing demand from residents living in high density dwellings (such as high rise flats or large multiple occupancy Victorian housing spread over several floors where space is limited) for sheltered secure cycle parking close to their property. We know that a lack of secure long-term cycle parking deters some people from cycling in Camden. In order to address this and promote walking and cycling (one of the key objectives of Camden’s Transport Strategy), the Council has started a programme to provide secure cycle parking units in locations across the borough where there is demand. By introducing this secure cycle parking unit, alongside the cargo bike parking space, cycle parking security for residents will be improved, encouraging the use of sustainable forms of transport, and helping to reduce traffic congestion on Camden’s streets. During the previous public consultation for secure cycle parking units, several residents responded that they would like to have a choice on the look and feel of the type of cycle parking unit that would be installed on the street. We are now able to offer you a choice of two different types of units, and are asking you to let us know your preference. To help you decide, we have included key information for each type of unit, one made by Cyclehoop and the second by Asgard. Each unit 1.36m high with a curved profile roof. 3 units can fit in one 5m parking space, allowing 9 bicycles to be parked securely as each unit accommodates 3 bicycles. Each unit is 1.6m high with an angled profile roof. The above images show both external and internal views of the units. They have reflective strips on the side for safety & visibility at night. If approved, the units will be installed in green colour only. Further information about the Cyclehoop and Asgard storage units is attached to this online consultation. If approved, the scheme will be implemented in 2019. The Council would take responsibility for the installation of the bike hangar, however it would be managed by the relevant manufacturer who will maintain the unit; the cost of this is covered by the annual membership fee. All affected property frontages inclusive of businesses, local groups, statutory groups and ward councillors. Under the Local Government Access to Information Act 1985, your consultation response will be available for inspection if required; however, your personal details will remain confidential. Please only write to us with matters associated with this consultation. If you do have any further questions or require clarification about the proposed scheme, please do not hesitate contact Richard Walter on the above contact details. Strategy Service, 5th Floor, 5PS, FREEPOST RSLT-RJBR-TXAA, London Borough of Camden, Town Hall, Judd Street, London, WC1H 9JE. Any information you provide on this form will help us in making an informed decision on the scheme. At the end of this consultation period, officers will consider all responses received and write a report with recommendations. This report will be presented to the Director of Regeneration and Planning (Supporting Communities Directorate) who will make a decision whether or not to proceed with implementing the proposals.